Projects Abroad have made a donation of food and medicine to the Chincha area, one of the worst hit areas in last month’s earthquake. Projects Abroad Peru also held a barbeque in order to raise funds to provide more aid to those in the effected area on Friday 7th September at the Projects Abroad office. All Projects Abroad Peru volunteers, host families, partner teachers and staff were invited to join us in support of this worthy cause. 'On Wednesday 22nd August I met Yessika and we went to Cuzco to the bank to pick up the money that Projects Abroad had sent as a donation from England. Then we met with Tim, the Projects Abroad Peru Director, who was in a meeting coordinating with Mayten Ruiz, a kindergarten teacher in Cuzco who is from Chincha. 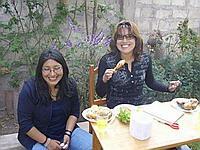 She was preparing a donation to take to Chincha through her school and was pleased to take our donation too. We felt happy that the donation would be in good hands. 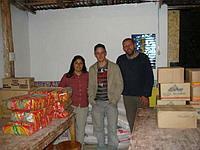 Finally Tim, Yessika, Mayten and I started to buy the provisions. We bought 15 sacks of rice and 2 of sugar, each sack weighed 50kg. We also bought 2 sacks of salt, 60kg of pasta, ten boxes of tuna, fruit juices, cotton, medical alcohol, and tin openers.